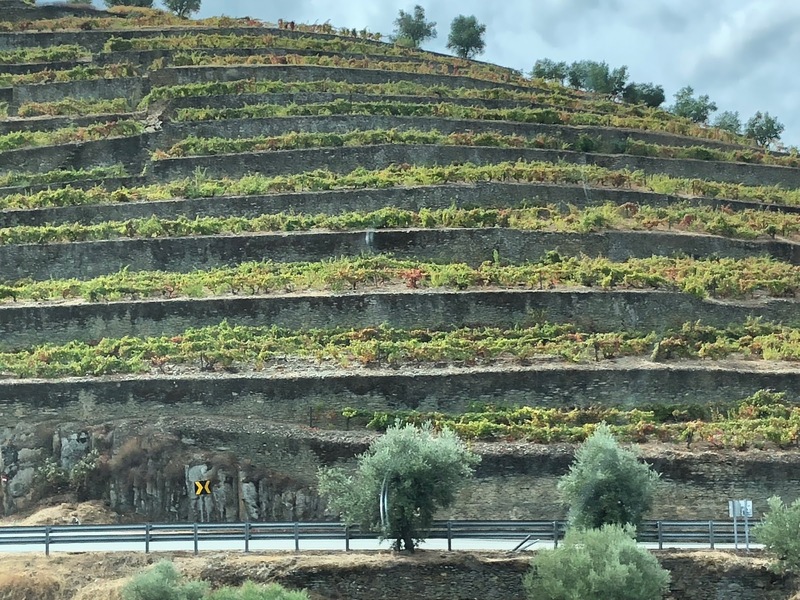 How was the 2018 harvest in the Douro River region? 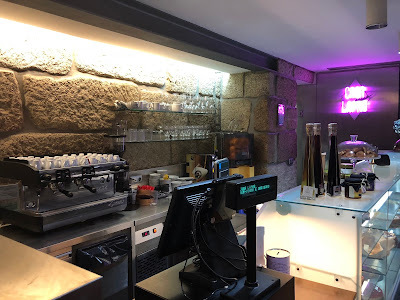 During my trip to Portugal, we visited several wineries, including Caves da Murganheira, Quinta do Covela, Quinta do Vallado, Croft Port, and Cockburn's Port. At each place, I asked them about the harvest, which had largely finished by that time. They were mostly in agreement about the nature of the harvest, with one intriguing outlier. During the Spring, there were some terrible storms, rain, hail and floods, that plagued France and Portugal. For example, in Bordeaux, over 8,000 acres lost about 80% of their vines, with other areas losing smaller portions of their vineyards. In Champagne, about 4500 acres were damaged, including about 2500 acres of vineyards that were completely destroyed. 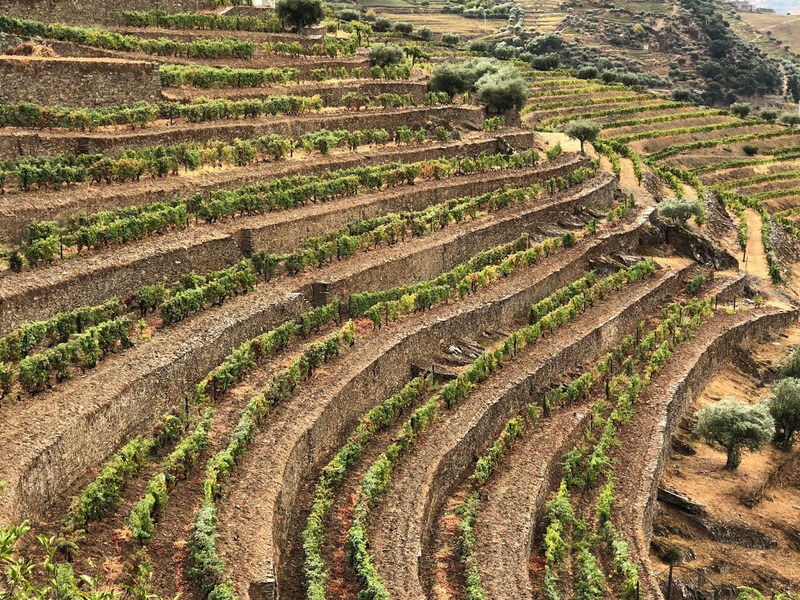 Numerous vineyards in Portugal sustained significant damage as well, from 80%-100%. 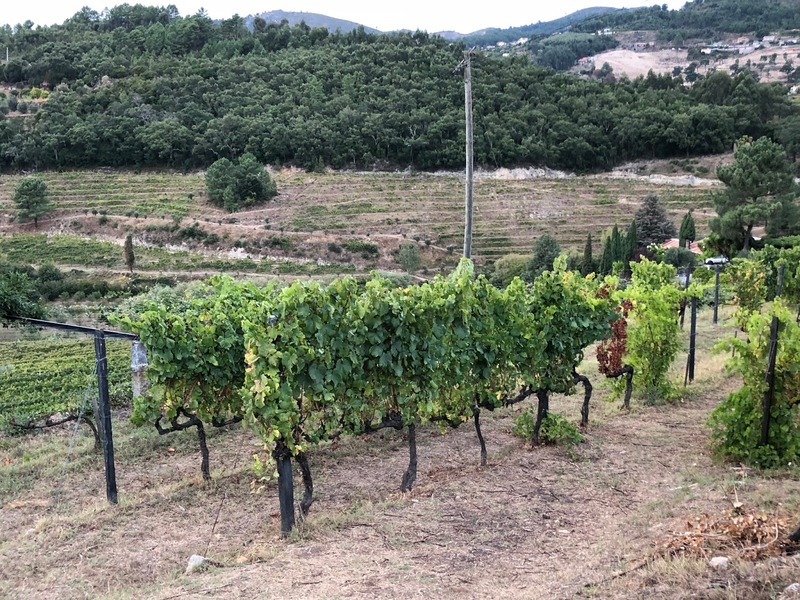 The weather was devastating during the spring but then the summer also brought some extremely high temperatures, further damaging the vineyards. All of the wineries indicated it had been a challenging or difficult year, due to the terrible storms, rain and hail, as well as the intense temperatures during the summer. Despite any of their losses in the vineyard, they indicated that the wines would still be good. Thus, production might be lower than usual, but the quality of the wines should remain good. 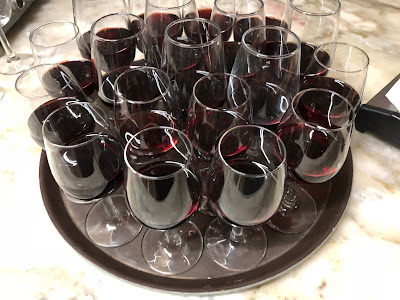 However, it doesn't seem that 2018 will be declared a general Port Vintage though it is too early to make such a decision, which commonly occurs about 2 years after a harvest. For example, this past Spring, 2016 was generally declared as a vintage, and producers have been talking about the high quality of their ports. And the 2011 vintage has been said by some to be possibly the best vintage of the 21st century. 2015 was not generally declared as a vintage, though some producers did declare and released vintage Ports. Individual producers could declare 2018 to be a vintage for them, though that decision won't generally be made until 2020. It is possible that Cockburn's Port will do so, based on comments their representative made to me. The representative claimed that despite the challenges, 2018 is going to be an outstanding vintage, better than 2011 and potentially the best of the century. That is very different from what I heard at the other wineries. We'll have to wait and see. 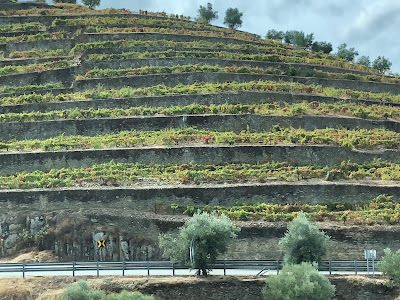 Please note that this was only a small sampling of Douro area wineries but it at least gives a potential indication of what might have occurred this harvest for the majority of wineries. More information will likely be forthcoming during the next couple months, though the major decisions about the vintage won't take place for two years. Here I am, dressed for dinner. 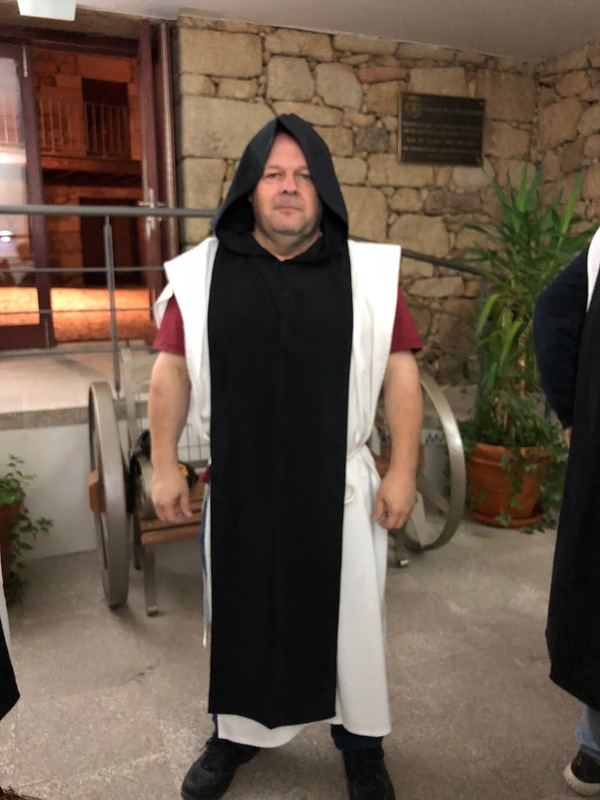 Yes, that was the proper dress for a dinner I enjoyed during my time in Portugal. Everyone dressed like that and we had quite a fun time, savoring a meal of roast suckling pig. I almost decided to join a monastery and become Brother Richard of the Vines. 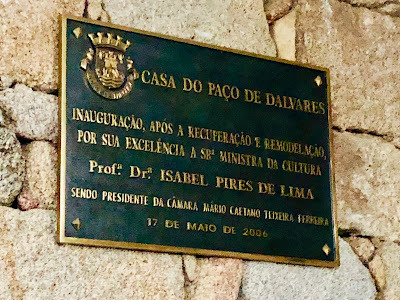 We dined at the Casa do Paço de Dalvares, which initially had been a manor house in the 18th century, owned by Egas Moniz, and known as the Honor of Alvares. It is located in Tarouca, in the Valley of Varosa, and now contains the headquarters of the Confraria do Espumante (Sparkling Wine Brotherhood), a Sparkling Wine Museum, and the Tavora Regional Wine Commission. The stone building has a strong medieval feel, almost transporting you back in time. Some of the fun women from our trip, garbed in the black and white. We sat at a large, U-shaped setting, being served family style. We began our dinner with simple bread and water, a nod to the monastic past, and then a salad, with fresh veggies, was served. The centerpiece of the dinner was Roast Suckling Pig, accompanied by roasted potatoes. 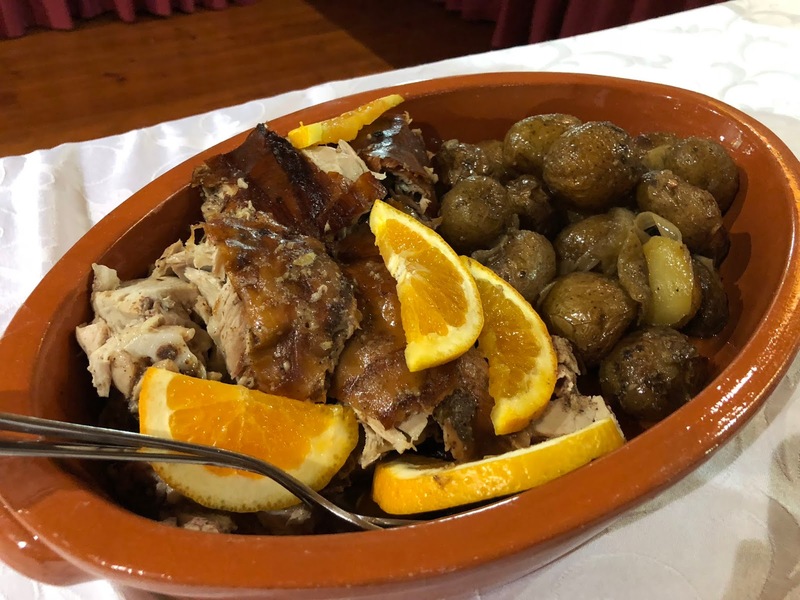 Succulent and tender, the pork was absolutely delicious. It came with a container of some type of sauce, which turned out to be fairly spicy, and perfect for the pork. As soon as the suckling pig ran low, they brought out a new plate. Forget endless breadsticks, it is endless roast sucking pig for the win! 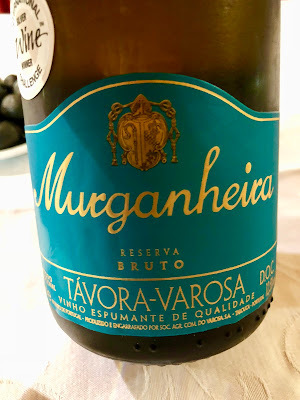 Appropriate for the region and the nature of the Casa do Paço, we enjoyed local bubbly from Caves da Murganheira (which I previously reviewed). The Reserve Bruto was dry, crisp and fruity, a pleasant sparkling wine which I enjoyed throughout much of the night. The Malvasia Fina Bruto was more aromatic and floral, with underlying notes of dried fruits. Plenty of fun, delicious pork, and tasty bubbly. I loved Portugal and can't wait to return. For many people, Vinho Verde is a slightly effervescent, light, fruity, low alcohol, and sometimes mildly sweet, Portuguese white wine. It is a great summer wine, and also pairs well with seafood and plenty of other dishes. However, not all Vinho Verde is the same and it's worthy to explore what else this region has to offer. 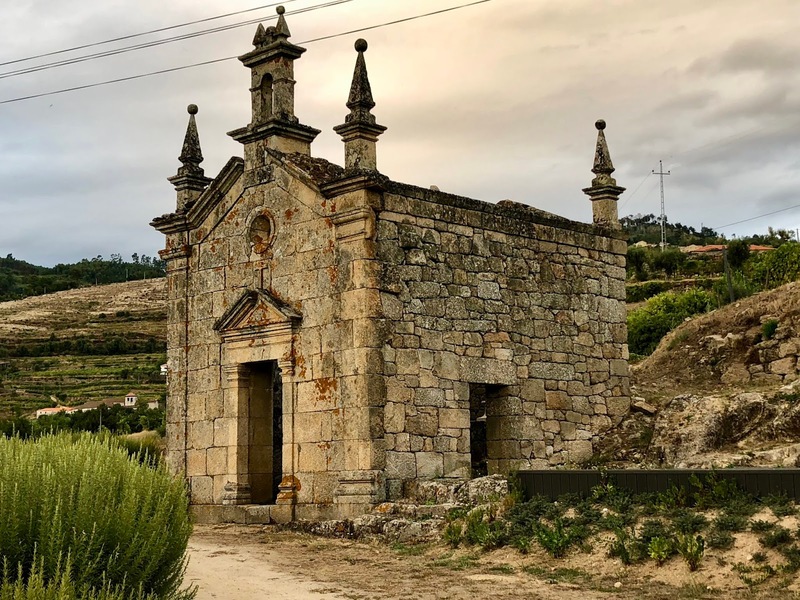 We need to get over the misconception that Vinho Verde is a singular type of wine and seek out the diversity that exists. 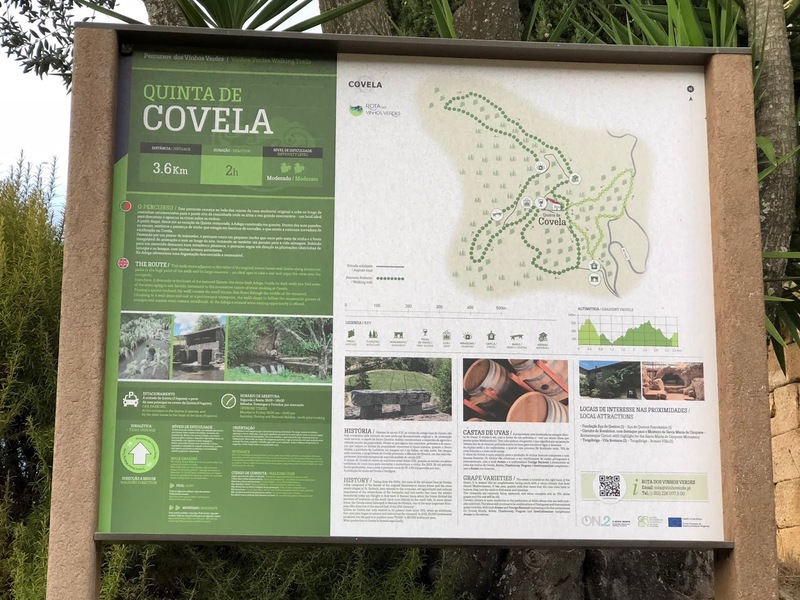 During my recent trip to Portugal, we visited Quinta de Covela, an estate whose history extends back to the 16th century. 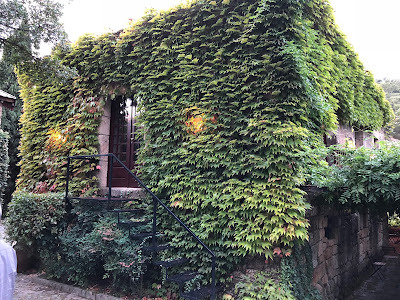 You can see several beautiful, granite buildings and ruins on the property which reflect this origin. The granite stone also is relevant as it is a significant difference between the Vinho Verde DOC and the Douro DOC. Our tour of this estate was led by Paula Pereira, who works in marketing & public relations for the winery. As I recently wrote about Paula: "From the opening moments of meeting her, you couldn't help but be enamored with her bubbly enthusiasm, her sincere and infectious passion for Covela. 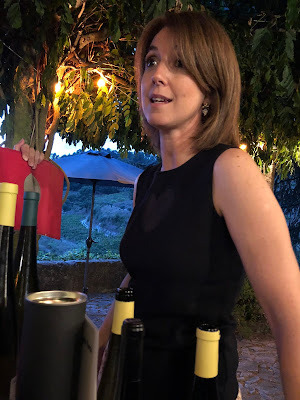 As she led us through a wine tasting, her passion never lagged and she presented us with plenty of information about the estate, the region and the wines. It became a fully enjoyable and informative tour, and we could have easily remained there for hours chatting with Paula. My tour companions all commented on Paula's compelling personality and she was the perfect advocate for Covela." Quinta de Covela is located on the right bank of the Douro River, in the city of Baião. 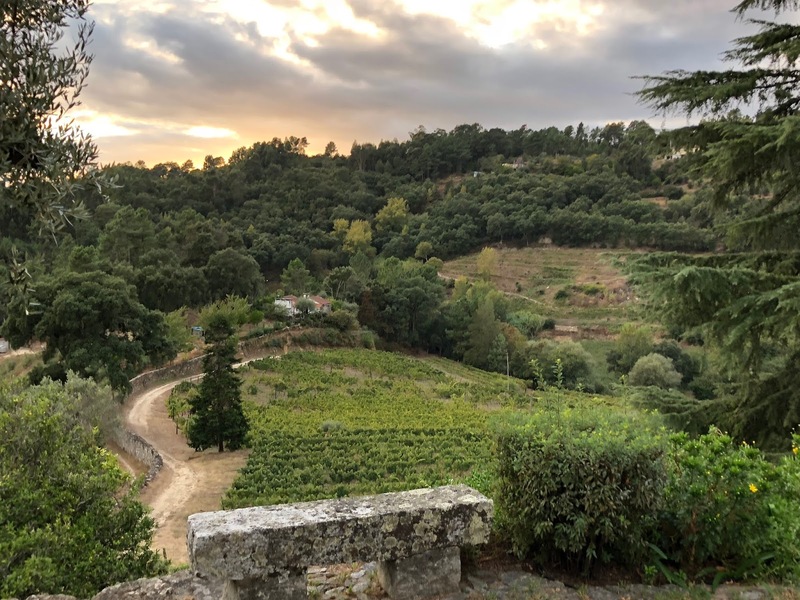 The estate was once a farm and in the mid-1980s, an entrepreneur purchased the property, choosing to plant indigenous and international grapes. Wine has been produced on the estate since the 1990s, and eventually, in 2011, the property was acquired, at auction, by two friends who wanted to make it an even better vineyard and winery. 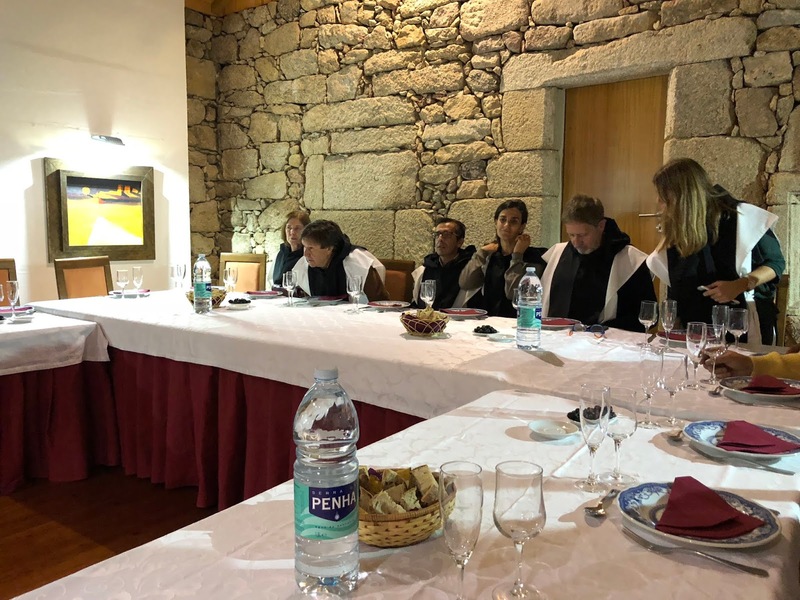 As Lima Smith LDA, friends Marcelo Lima, from Brazil, and Tony Smith, from Britain, have also acquired two other Portuguese wineries, Quinta da Boavista and Quinta das Tecedeiras. The term "Covela" refers to a "hole," and if you look down the vineyard terraces from on high, the view seems almost as if you were looking down into a hole. The estate consists of about 45 hectares, with 20 hectares of vineyards. Their vineyards were certified as organic in 2018, and they are working on the process of getting their wines certified organic as well. The microclimate of this region gives the area a Mediterranean flair. 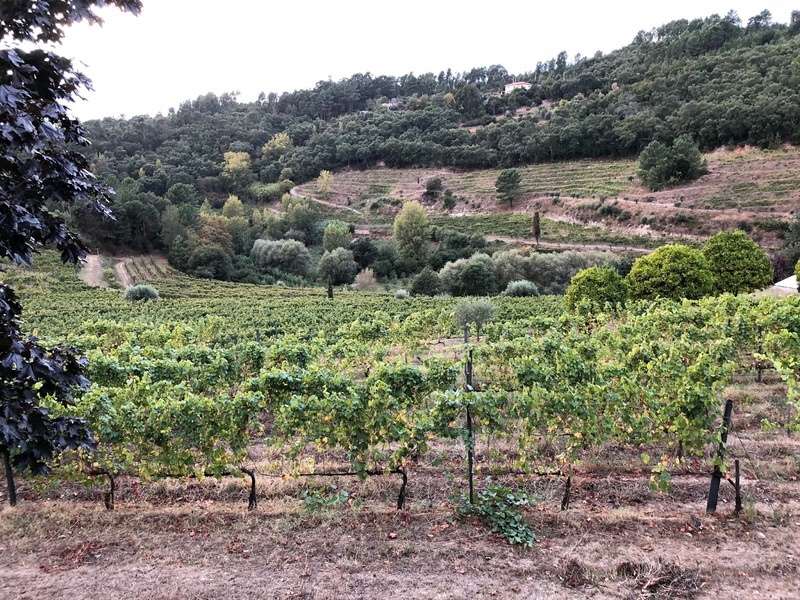 The estate currently grows grapes including Avesso, Arinto, Touriga Nacional, Chardonnay, Viognier, and Gewurztraminer, though they are moving towards growing more indigenous grapes and less international ones. Since 2012, they have been making single varietal Vinho Verde wines from Avesso and Arinto. 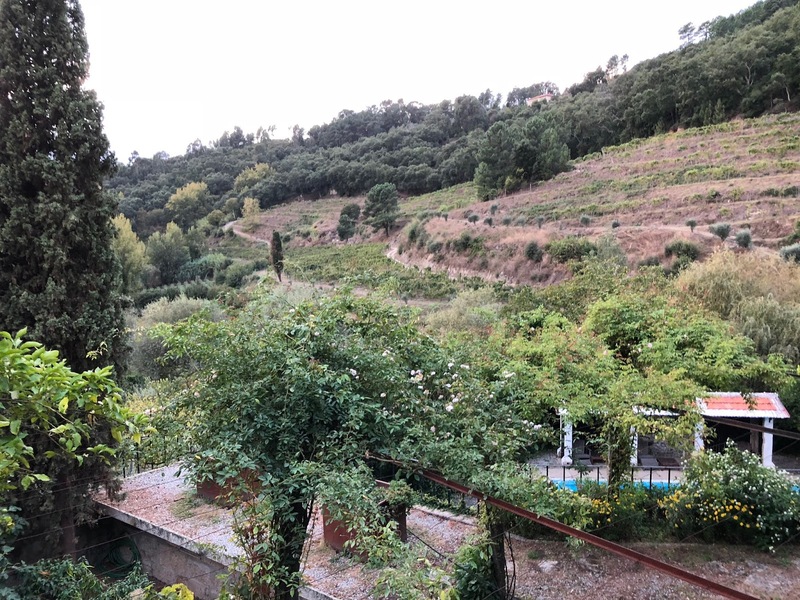 Annually, they produce about 150,000 liters of wine (about 200,000 bottles), and 90% of those are White wines and 10% Rosé. Over 50% of their production is exported, including to the U.S. 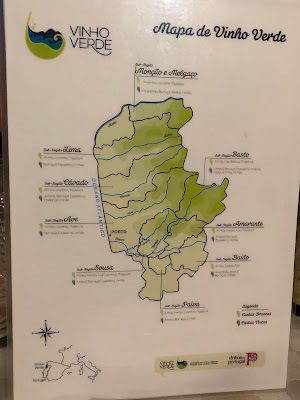 The Vinho Verde DOC region was demarcated in 1908 and there currently are nine subregions, including Amarante, Ave, Baião, Basto, Cávado, Lima, Monção e Melgaço, Paiva, and Sousa. The region encompasses approximately 21,000 hectares of vineyards (with 47 grape varieties), 18,000 winegrowers, and 600 bottlers. Annually, the region produces about 80 million liters of wine, with 87% White wine, 7% Red and 6% Rosé wine. I am intrigued to learn more about the specific differences between all the subregions, to better understand their different terroirs. Besides still wines, you might not know that the Vinho Verde DOC also includes: White, Red and Rosé Sparkling Wine (designated Espumante de Vinho Verde), Vinous Spirit and Grape Marc Spirit (designated Aguardente Vínica de Vinho Verde and Aguardente Bagaceira de Vinho Verde), and even White, Red and Rosé Wine Vinegar (designated Vinagre de Vinho Verde). 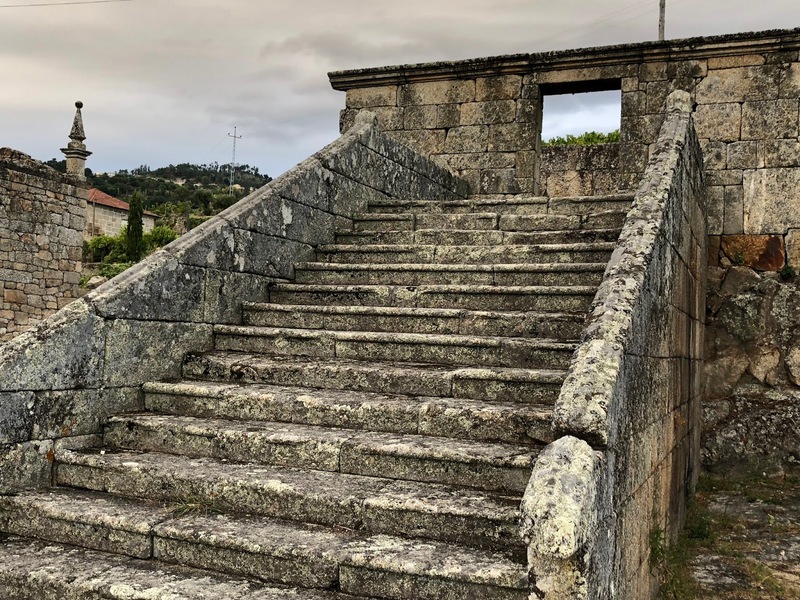 As it is now easy to see, the Vinho Verde DOC possesses much more diversity than many realize. The Baião subregion borders on the Douro DOC, though the primary, and quite significant, difference is that Baião has granite rather than schist soils. The climate in this region is less temperate with colder, drier winters and hotter, drier summers, especially conducive for grapes with a longer ripening time, such as Avesso. Baião is thus well known for this grape variety, tending to produce wines that have an intense, fruity aroma and sharp acidity. 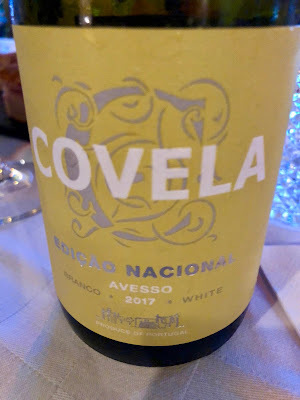 It was only natural then that the first wine we tasted was the 2017 Covela Avesso (about 8 Euros), made from 100% Avesso. The name of the grape may be translated as "inside out" or "contrary." 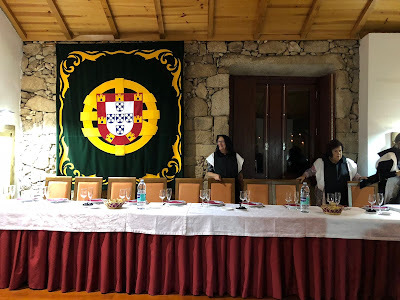 It is a challenging grape, grown especially in Baião, as well as a few other subregions including Amarante, Paiva and Sousa. In 2010, only about 1800 acres were planted with Avesso. At Covela, Avesso is harvested at various times and not all at once. 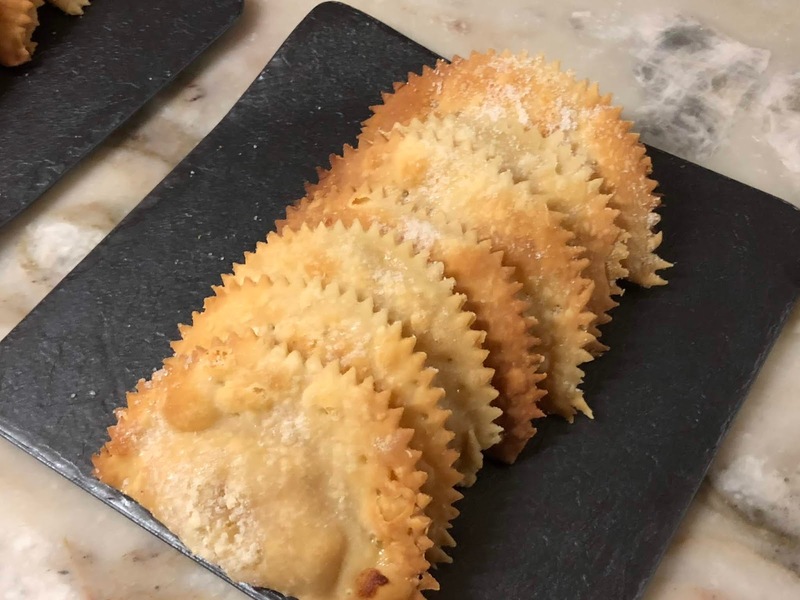 Paula stated that the Avesso is "shy on the nose," not too aromatic, and the taste "makes you salivate, yearn for food." 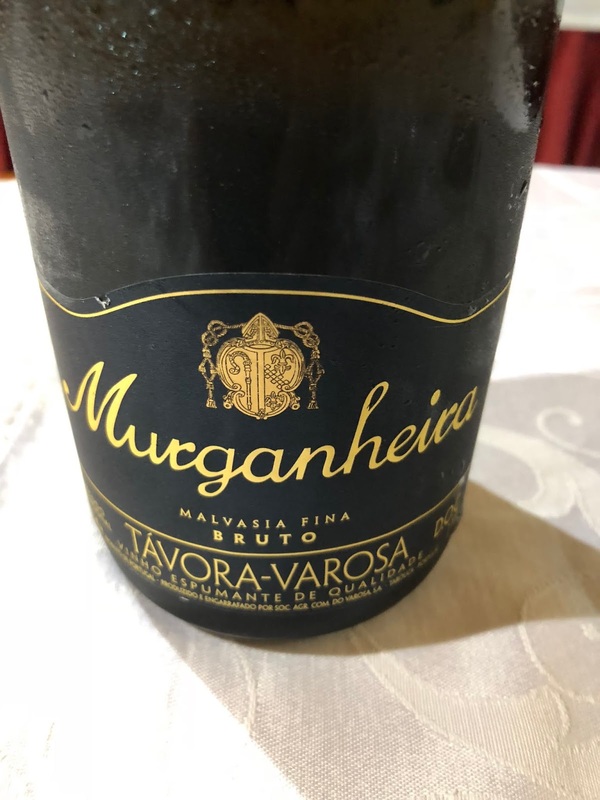 The aromas were subtle, with hints of peach and pear, and on the palate, the wine was crisp, dry and fruit, with bright tastes of pear, green apple and a hint of more tropical fruit. With a medium-body, the wine was certainly delicious and mouth-watering, with a pleasing and fairly long finish. Easy-drinking, this wine would be enjoyable on its own, or paired with seafood, light chicken dishes, and more. Paula recommended pairing this Avesso with cured cheese. An excellent value wine. 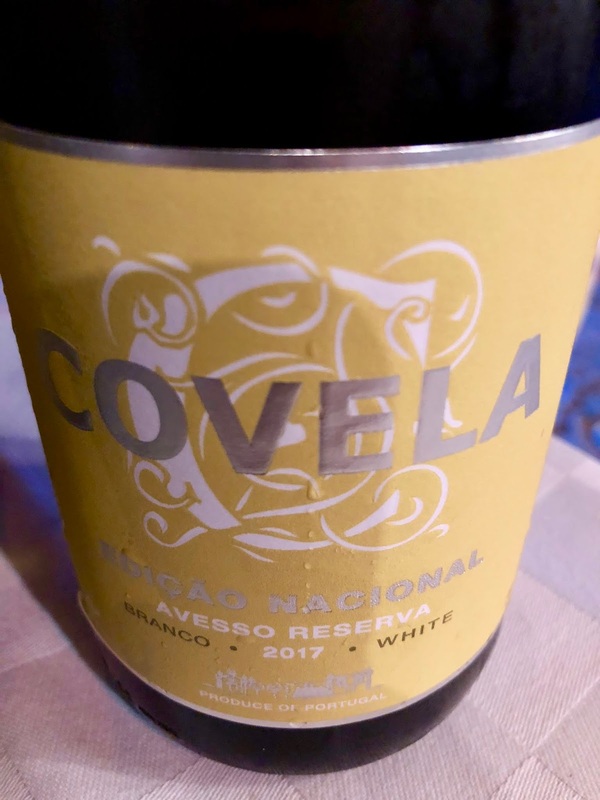 We moved onto the 2017 Covela Avesso Reserva (about 12 Euros), which spends about 7 months in 2nd use French oak. The aroma presented subtle spice notes, and on the palate those spice notes complemented the fruitiness of the wine. It possessed an intriguing exotic feel, the oak subtle enough so it didn't overwhelm the other flavors of wine. Paula recommended pairing this wine with something that has fat, like lamb or tuna. White wine with lamb? Yes, though it sounds unusual it can work with the proper wine. 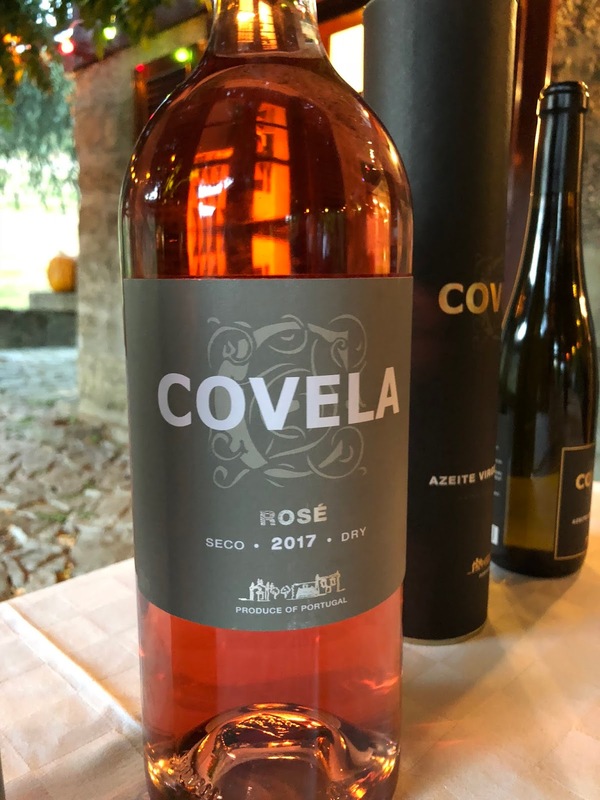 Finally, we enjoyed the 2017 Covela Touriga Nacional Rosé (about 8-9 Euros), a non-DOC wine, which is made from 100% Touriga Nacional. They have been removing their Cabernet Sauvignon vines and replacing them with Touriga Nacional. Paula states that wine growers hate Touriga, for being too difficult, but wine makers love the grape. 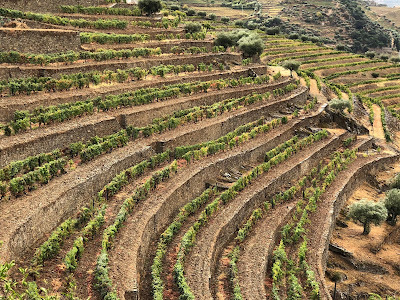 Touriga Nacional originated in the center of Portugal and the soils of Covela are thought to be a perfect area for growing the grape. 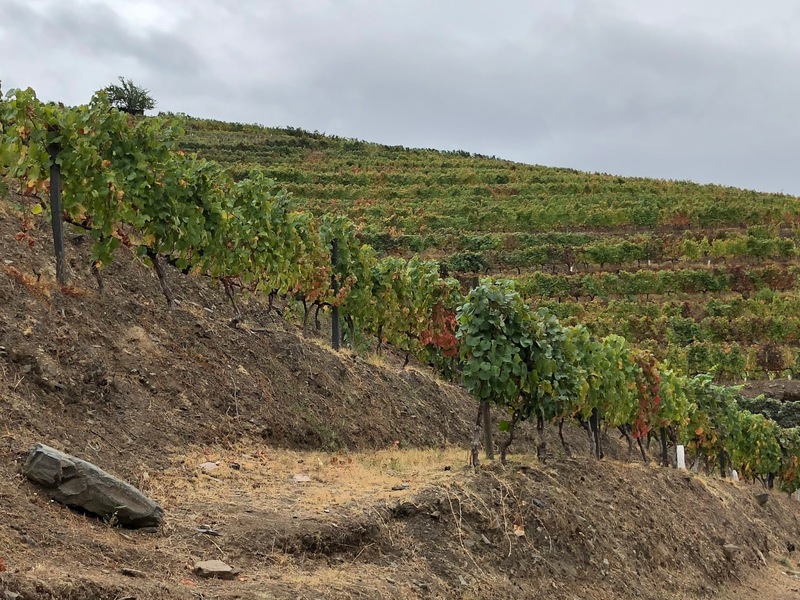 Though Touriga Nacional is very important for making Port wine, growing well in the schist soils, the granite soils of Covela are more in line with the origins of the grape. The Rosé possessed a very pale pink color and its aroma was almost savory, with mild notes of red fruits. On the palate, it was light and crisp, dry and elegant, with delicious notes of strawberry and cherry, as well as wisps of floral notes. Such a fine example of Rosé and definitely the style I prefer. Another excellent value wine. 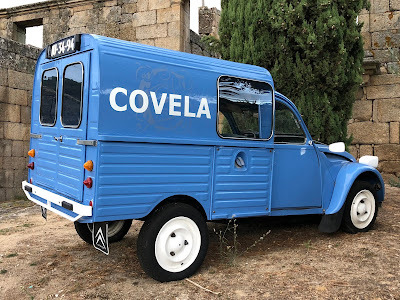 The wines of Quinta de Covela were delicious, compelling and excellent values. They are imported into the U.S. and I strongly urge you to seek them out. 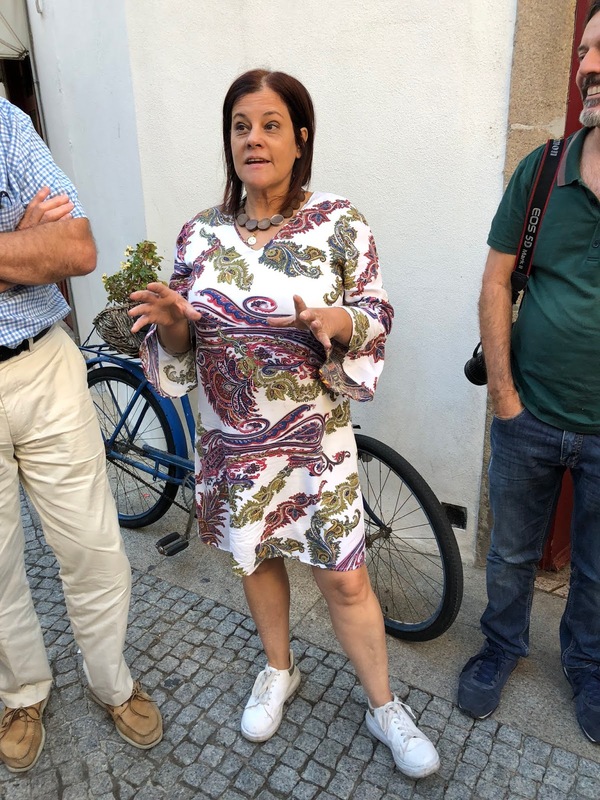 Many thanks to Paula Pereira for providing us such a fun and informative tour. 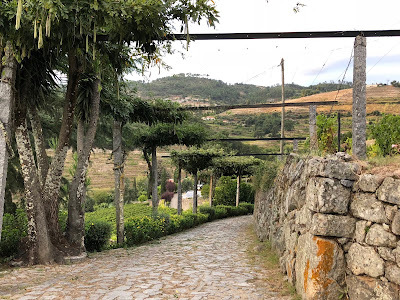 An important takeaway is to break out of your preconceptions about Vinho Verde, seeing it as a monolithic wine style. There is plenty of diversity to be found in this region beyond the simple, effervescent wines you enjoy each summer. 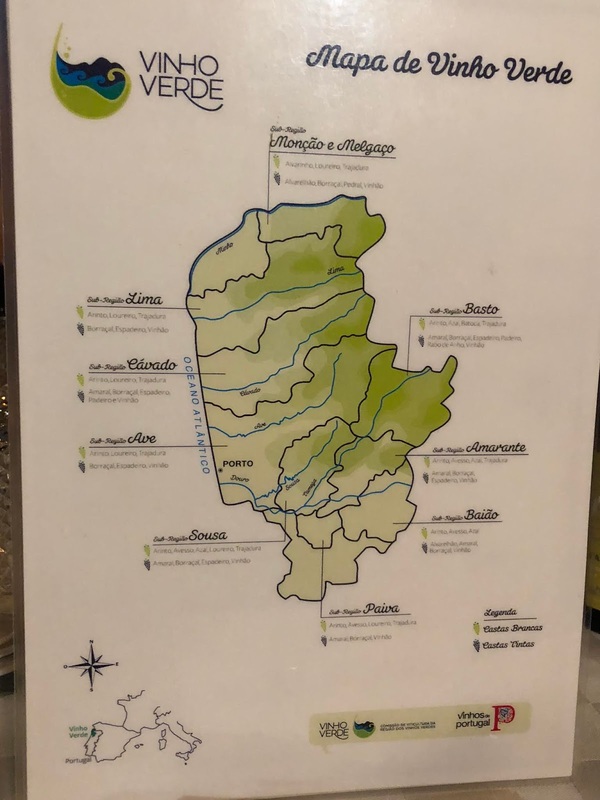 The Vinho Verde DOC is also a region of different terroir, with nine subregions each offering their own unique take on these wines. It is difficult to experience this diversity though as the wines are hard to find in local wine stores. 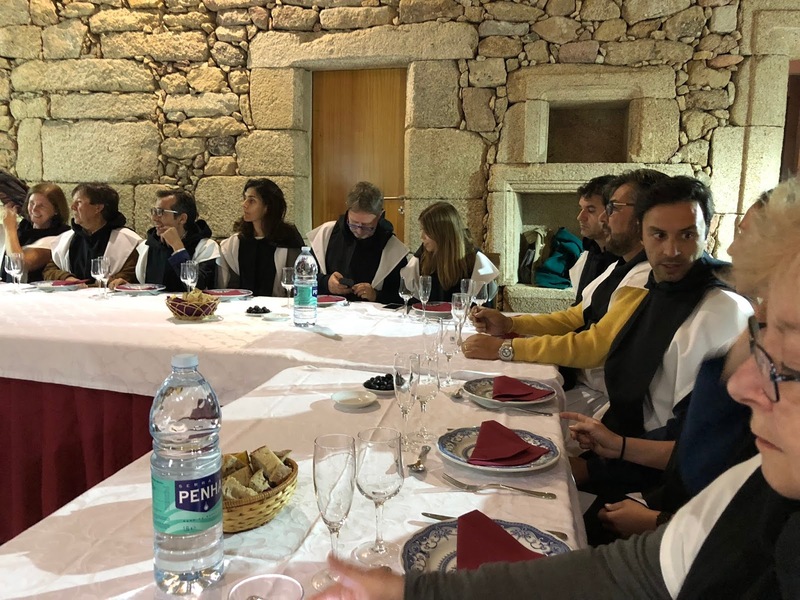 Hopefully that will change as more producers in the Vinho Verde DOC highlight their diversity and export their wines to the U.S.
Every year countless people stress over which wines to pair with their Thanksgiving dinner. They read all the wine articles, which give recommendations of which wines you should drink, though many of those articles are similar year to year. They speak to the staff at their local wine store, who give them recommendations. These people also worry that their holiday might be a failure unless they have the correct wines. The holidays can be stressful enough without having to worry about the wine, especially when those worries are generally needless. Stop stressing so much about Thanksgiving wines. Cast your memory back to last year's Thanksgiving. Can you remember which specific wines you had with dinner? Can you remember the specific wines you had with Thanksgiving dinner two years ago? Doubtful. I am sure that most people won't be able to remember except maybe in the most general terms. Maybe they recall having had a Pinot Noir or a Riesling but they are unlikely to recall the specific producer or much else about the wine. What they are more likely to remember is the good (at least hopefully it was good) time they had, the family and friends that shared their table. They might remember whether the food and wine was good or bad but the specifics may be foggy. Do you really need specific Thanksgiving wine recommendations? I don't think so. The more I ponder the question, the more I realize that all you need for Thanksgiving are some good wines, the varietals and/or blends being much less important. As long as they do not blatantly clash with the meal, then they should work and few wines are going to so blatantly clash. Drink wines you'll enjoy and don't worry so much about "perfect pairings." A Thanksgiving meal is diverse, with many different flavors, from savory to sweet, and many different textures. No single wine is a perfect pairing with all of these different dishes. So you need wines that people will enjoy in of their own right. I don't think too many hosts are seeking the "perfect" wine pairing. They simply want something that people will enjoy and which won't greatly detract from the food. Plus, who'll remember the wines next year? We should remember that any wine shared with good friends and family is likely to taste better, or at least seem that way, than one drank alone. The circumstances of the day, the good feelings, the fond memories, the thanks for the past year, will all lead to your wine seeming better. And it is all those urrounding circumstances that people will most remember about Thanksgiving. The wine will always take the back seat. I will probably bring a variety of wines to my Thanksgiving feast, a mix of sparkling wine, white, red and dessert wine. Having a good variety is beneficial, especially as different people have different preferences. In general, I will pick interesting and delicious wines that I feel people will enjoy. I won't spend much time worrying about pairing them with specific dishes and foods. I just want wines that will make people smile, that will enhance the spirit of the day. In Portugal, as opposed to France, it's more about sweets rather than pastries. 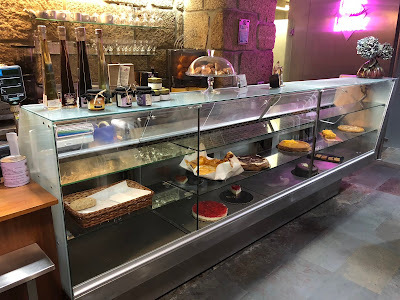 In addition, Portuguese pastries tend to use more sugar and egg yolks than French pastries, and they also tend to use more almonds and oranges. During my visit to Portugal, I sampled and enjoyed a variety of Portuguese sweets, including the iconic Pastéis de Nata, a type of egg tart. 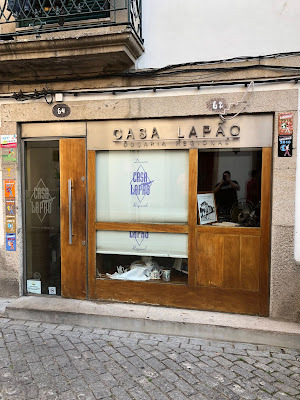 In addition, I visited Casa Lapão, a stellar bakery in the city of Vila Real, where I not only sampled their convent sweets but also learned how to make one of them myself. 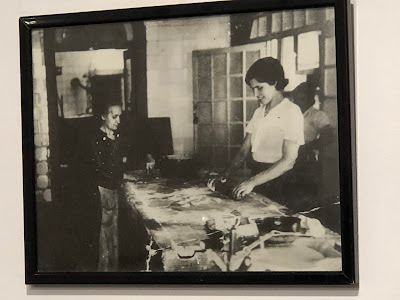 Our visit to Casa Lapão was led by Rosa Maria Cramez (pictured above), the 4th generation to own and operate this bakery. With an abundance of warmth and passion, Rosa told us the story of the bakery, explained how it currently operates, and taught us how to make Cristas de Galo, one of the convent sweets. Plus, we sampled a few of their pastries, paired with a glass of Port wine. Above is a photo of Rosa's great-grandmother, who was from Galicia, working in the bakery. The origins of Casa Lapão extend back almost 100 years, to Vicencia Augusta Cramez, a bread kneader, who had a daughter, Miquelina do Carmo Cramez. 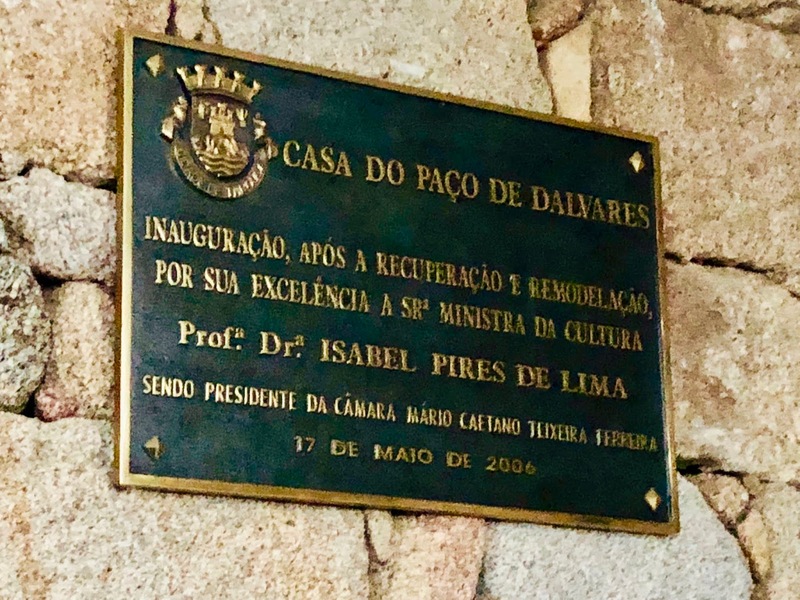 Miquelina eventually married Francisco Delfim, a painter in the construction industry, who was nicknamed Lapão because it was thought he resembled a native of Lapland. 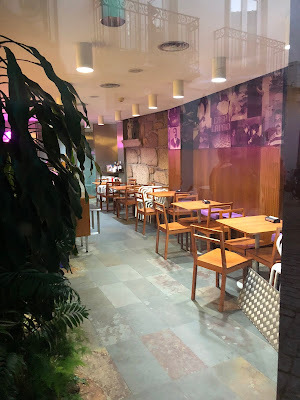 At some point, Francisco decided to open a bakery, using his nickname, and locating it on Rua da Misericórdia in Vila Real. Miquelina and Francisco were frequently visited by Delfina, a seamstress who had a sister in the Santa Clara Convent. 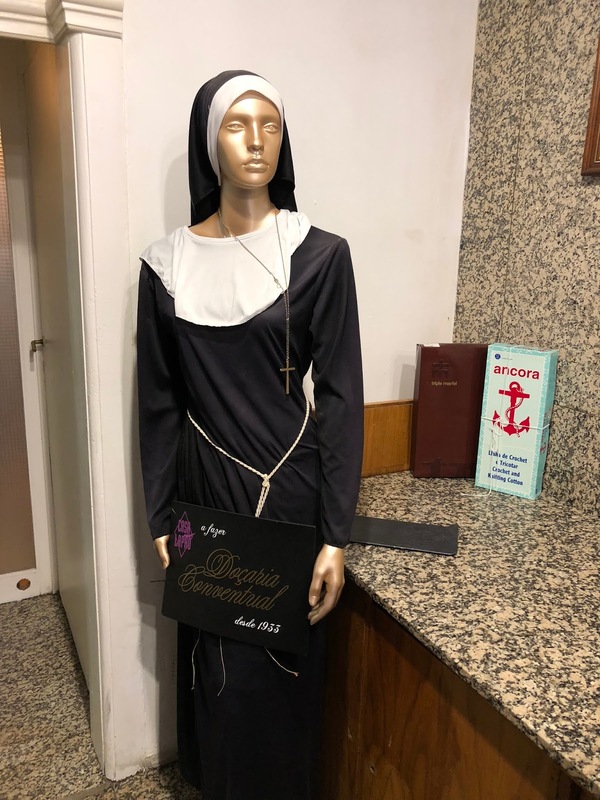 When girls entered the convent, they commonly gave a dowry of sugar, so the convent became well known for baking a variety of sweets and pastries. 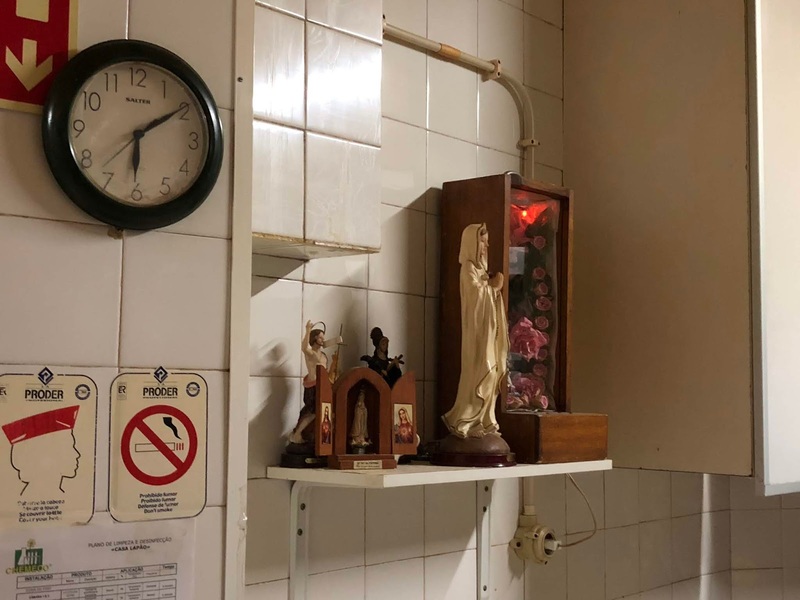 Delfina gave the recipes to these convent treats to Miquelina and Francisco, who started making them at their bakery, which proved quite popular. The baking area at Casa Lapão. Casa Lapão continues to make four varieties of convent sweets, as well as plenty of other items, and you can check out their list here. The bakery only has 5 employees, all women, and they make all of these items by hand, an impressive feat considering the volume of their output. 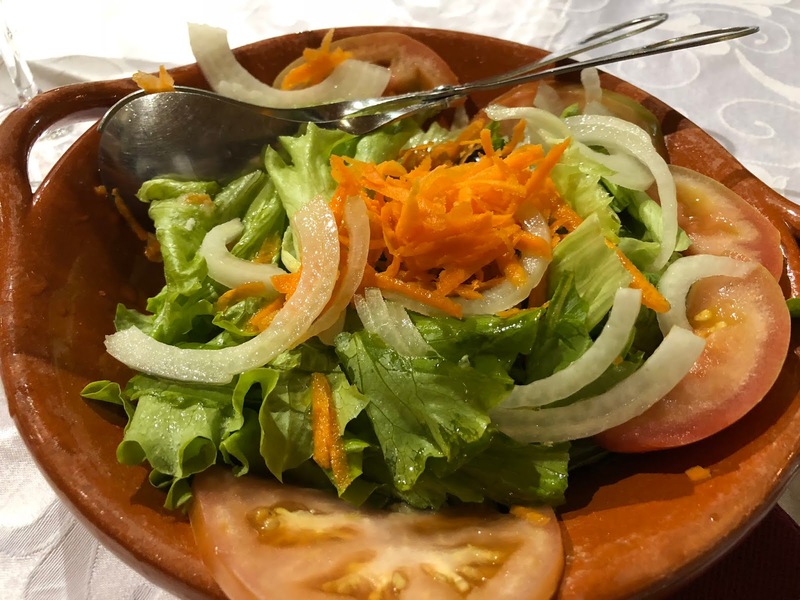 It is also impressive that they primarily use local ingredients. For example, they use about 4,000 kilograms of pumpkin each year. As the region of Vila Real was a poorer region, pumpkins were popular as they were easily grown and cheap, thus their use in the local pastries was common. 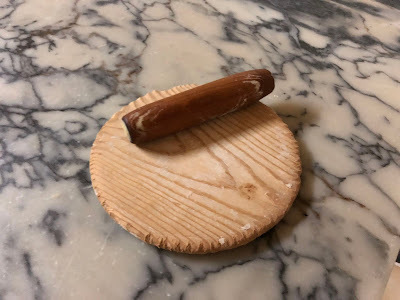 Rosa still owns, and uses, her great-grandmother's rolling pin! 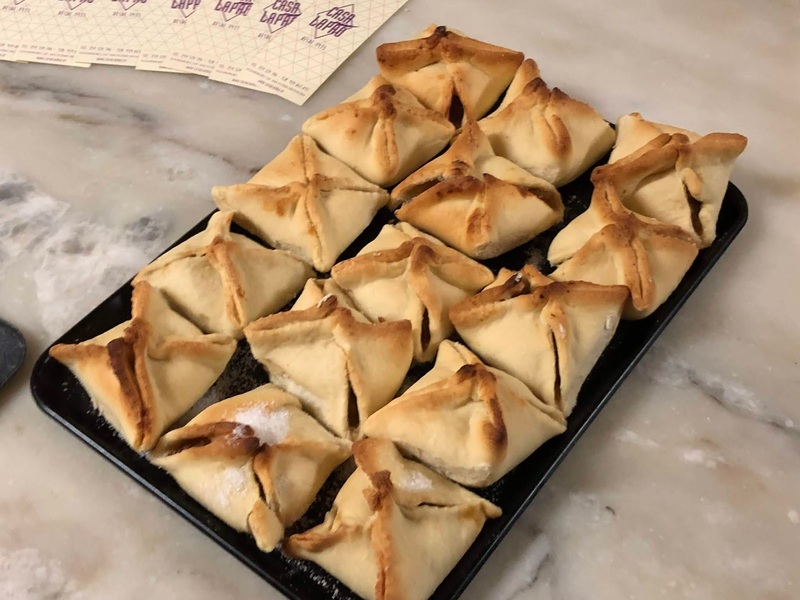 These are the Pitos de Saint Luzia, filled with pumpkin and cinnamon, which a young woman traditionally gifted to her suit on the feast of Saint Luzia (December 13), the patron saint of the visually impaired. There is a legend that this sweet was created by a novice who used to fold eye bandages into a square with the points inward, and decide to make a sweet in a similar manner. 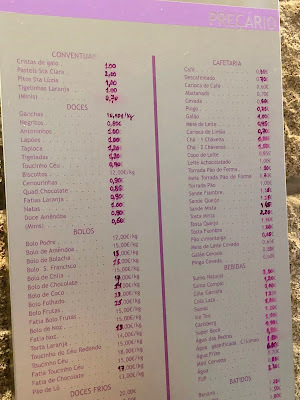 These sweets also were an example of a common theme I found during my visit to Portugal, an illustration of the concept of the sacred and profane. Casa Lapão likes to play with the names of their sweets, and Pitos is a slang term for the female genitalia, as it is thought there is some resemblance. Despite the sacred origins of these sweets, there is a splash of the profane with such slang. 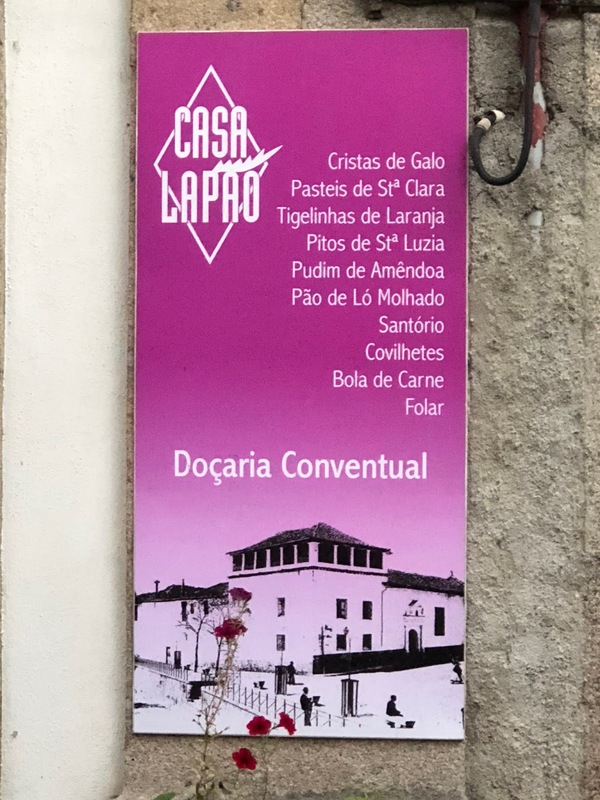 This dichotomy arose at several points during my tour and it seems very natural to the Portuguese. 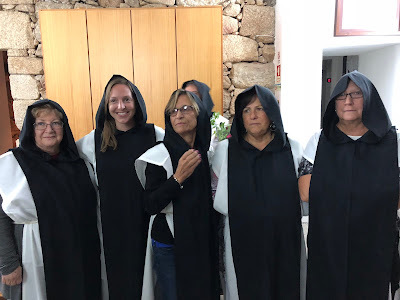 In part, it may be a way to show the Portuguese have a fine sense of humor, and are well grounded. As for their taste, they were quite delicious, with a fine flaky pastry shell and lots of sweet, creamy pumpkin filling with cinnamon hints. 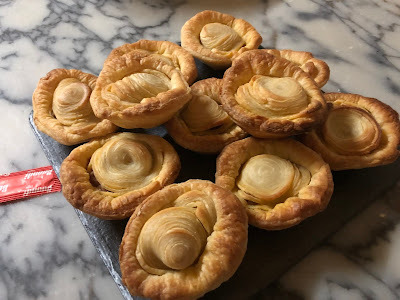 They weren't overly sweet and there was a good balance between the pastry and filling. It certainly is an excellent fall dessert and would be a great addition to a Thanksgiving dessert table. The Cristas de Galo ("crest of the rooster") received its name as it is shaped like a rooster's cockscomb. The pastry, filled with an almond and egg yolk paste, is baked in the oven. Again, the flaky pastry shell was buttery and delicious, with a creamy, rich filling with the fine taste of almonds. Another excellent sweet, and we learned how to make these. Rosa started our lesson, using her great-grandmother's rolling pin to roll out the dough for the Cristas de Galo. 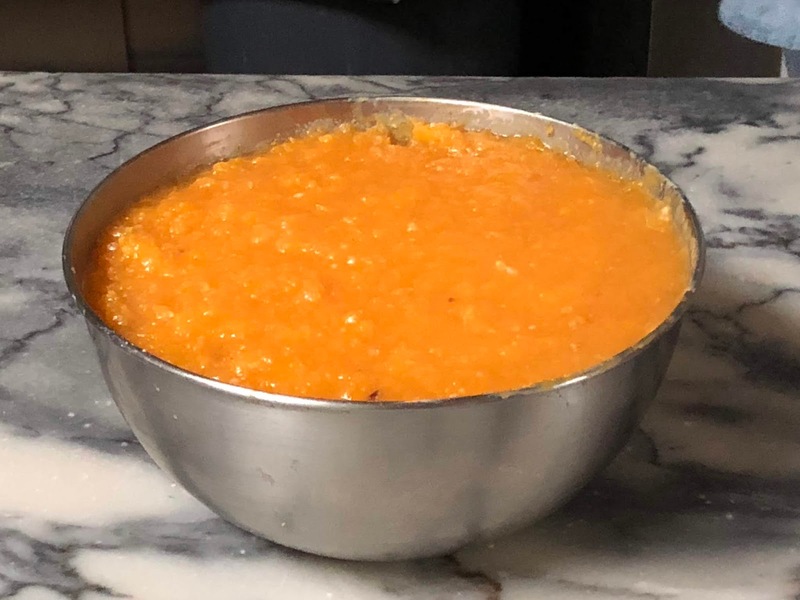 She already had the filling prepared, which though you might think there is pumpkin in it due to the color, there isn't. There are almonds, egg yolks and sugar in this mixture. 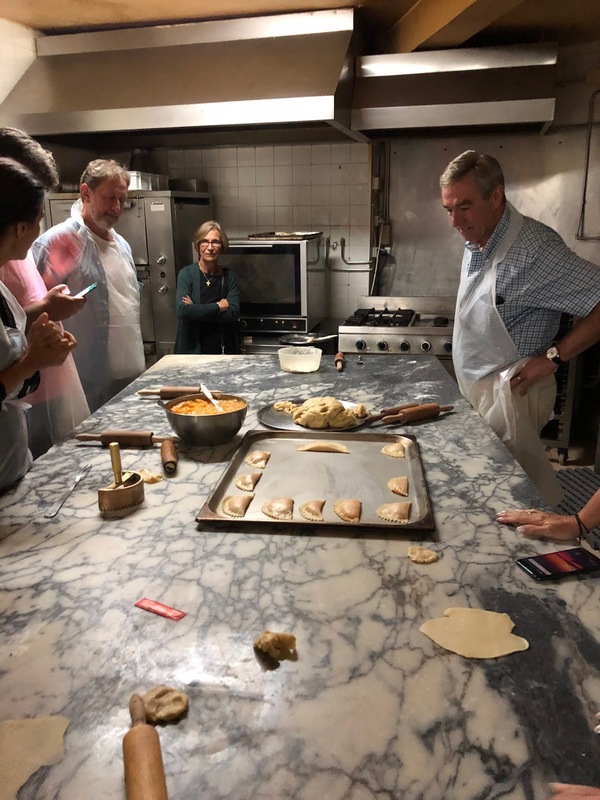 Once Rosa showed us what to do, we all tried to emulate her, rolling out our own dough, placing in the filling, folding the dough and then cutting the dough to give it the correct shape. We had plenty of fun, and once the pastries were baked, we were able to eat our results. I'll freely admit that I need much more practice making Cristas de Galo, as my attempt didn't look too good. It isn't that difficult to make, but in my defense, I do very little baking. I still enjoyed myself very much and would repeat it again if I had the chance. 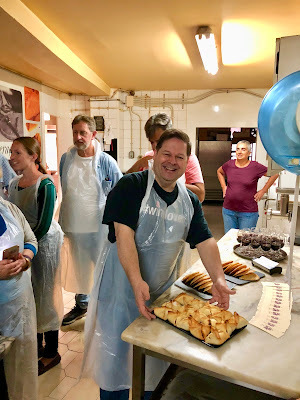 We also got to try the Bola de Carne, a pastry filled with ground meat, and it might have been venison. The pastry was flaky and light, and the meat filling was savory and spiced just right. This would make for an excellent appetizer. 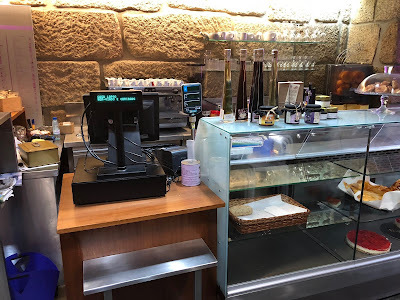 Across the street from the bakery is their cafe, where you can buy their sweets and pastries, either for take-out or you can dine in, enjoying them with a cup of coffee. 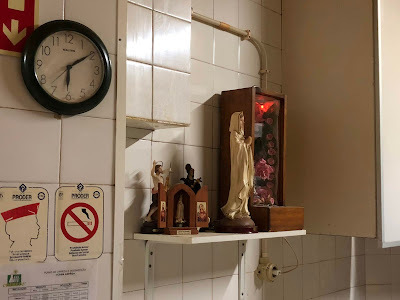 It is a casual spot, with plenty of photos from their history on the walls. It was closed at the time of our visit but Rosa let us inside for a look. 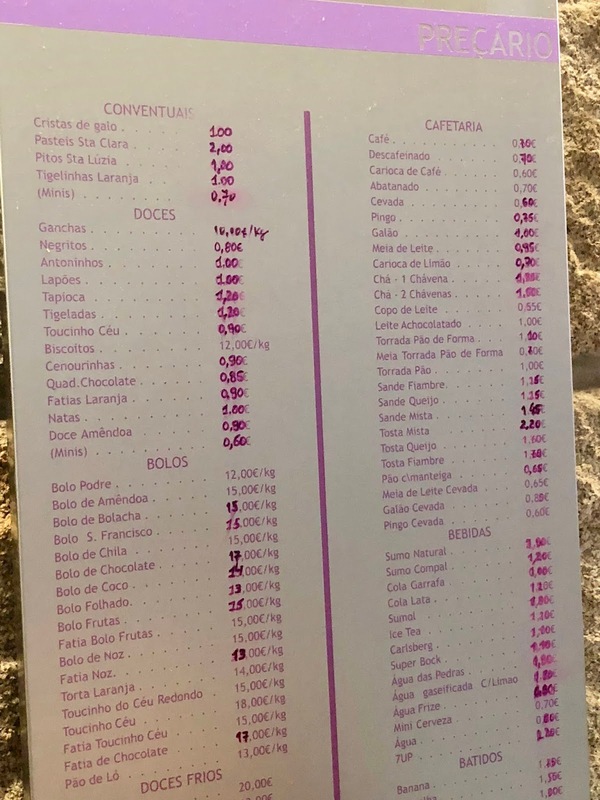 This is the cafe Menu, and you can see that the convent sweets are inexpensive, only 1 or 2 Euros, while a coffee costs less than 1 Euro. For such sweets that are homemade, prepared from local ingredients, and so delicious, this is a great value. If a similar bakery were in the U.S., I suspect the prices would be much higher. As the cafe was closed, the shelves were mostly empty. 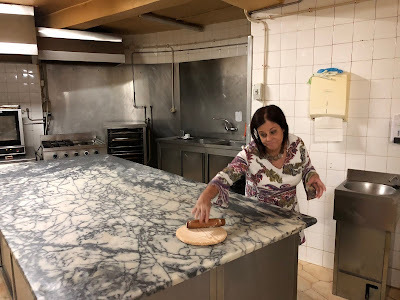 Many thanks to Rosa for providing us a fascinating tour of her bakery. 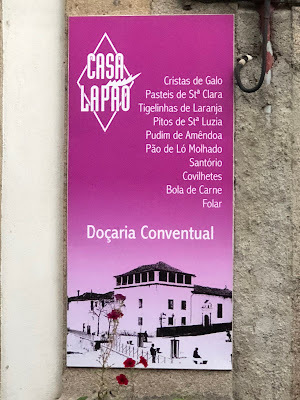 Casa Lapão is a worthy destination if you travel near the Vila Real region, especially if you love sweets. 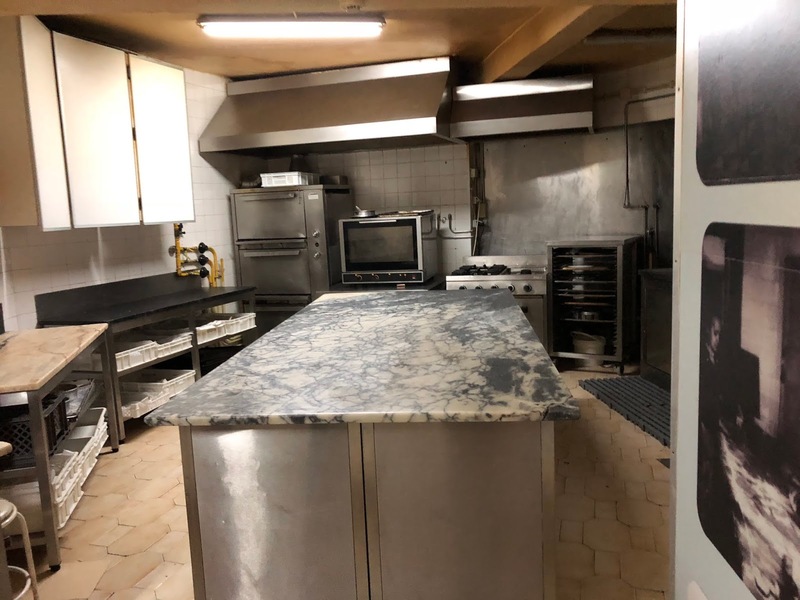 There is true passion at this bakery, as well as plenty of hard work, and I appreciate that they use local ingredients, helping their community. We need more places like this in the Boston area.